February 23, 2013, 10:15 AM · Last Monday, The Telegraph published an article called, Learning instrument does not make children more intelligent, experts claim, with the tag line, "Pushy parents who give their children piano lessons because they believe it will make them more intelligent are wasting their money, experts claim." SIR – I take issue with the suggestion that music has no beneficial impact on the brain and that those who study musical instruments and do better at school “simply have better-educated, higher-earning parents, and do more extra-curricular activities than other children their age” (report, February 19). Prof Glenn Schellenberg’s study of 130 children aged 10 to 12 may have led him to claim that “learning [an] instrument does not make children more intelligent”, but there is a huge body of research suggesting a positive impact on the human brain, especially on the areas that process speech. Music education also has an intellectual and social purpose. From my experience over the past 20 years, playing music in schools has a monumental effect on children, regardless of their age, nationality, ethnic or socio-economic background. At the very least, music education does no harm and, at best, it can completely transform a person’s life. Are these detractors blind to research, deaf to teachers or simply unwilling to invest in something they might not understand? Is music too physical, emotional or enjoyable to be deemed worthy of a place in “serious education”? If the issue is about dedication, I should state that it took me more than 15 years of work and discipline, often eight hours a day, from the age of seven, to reach a level of playing high enough for my profession. There is also a huge amount of mathematics involved in music – plenty to stimulate even the sharpest intellects. February 23, 2013 at 04:23 PM · What an article, in the Telegraph, I had not seen it. Music can make SUCH a difference for kids who come from an underprivileged background, we've all seen this! And of course, they chose a picture of the child who was slumped, pinkie caved in, no one had fixed her position...really not so nice for that child to have her picture in the paper that way! So glad you wrote a response! February 23, 2013 at 04:35 PM · In a classical education a student studied grammar, logic and rhetoric to prepare himself to study geometry arithmetic, astronomy and music. All seven together were considered the liberal arts and knowledge of them was required for one to consider oneself educated. 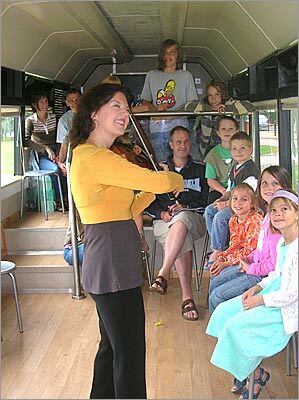 February 23, 2013 at 04:55 PM · It may well be that the kids who stick with music lessons have certain innate personality traits, such as self-discipline and perseverence. It also may be that those music lessons are the key for a kid from a chaotic background to discover and develop his or her inherent but unrecognized qualities of perseverence and self-discipline. Sports get huge credit for developing character, teamwork, etc. Music does the same thing, and appeals to a group of people who may not want anything to do with athletics. The more chances kids have to develop qualities they may not even know they have, the better for all. February 23, 2013 at 06:51 PM · WEll DONE TASMINE !!!! "Pushy parents who give their children piano lessons because they believe it will make them more intelligent are wasting their money, experts claim." "Sensationalist news reporter creates lousy tagline for a music education research study that overemphasizes IQ and equates it with intelligence." I don't necessarily disagree with the research, but I'm not too fond of the tagline given to it. I suspect that equating intelligence with IQ is the problem with the study. The principal investigator did mention that music was a valuable study in and of itself. February 24, 2013 at 01:29 AM · Bravo, Tasmin! Music education in the US doesn't get enough respect as it is for what benefits it fosters in the human mind, particularly in children whose minds are like sponges. February 24, 2013 at 11:42 AM · Who gives a hoot what the Telegraph writes anyway? Anyone would think it was a serious newspaper. These days apart from chasing MPs for expenses, & some column inches from Norman & Boris, the prerequisite of being one of their readers is to be into comedy. February 24, 2013 at 03:30 PM · I would be afraid of breaking my bow on the roof, but again, I'm 6'3" and worry about that everywhere.